Yes, the kid is only about ten. Take it up with his giant blue partner if you have a problem. Brave Police J-Decker, the fifth program in the Brave Series, is a show about giant transforming robots (not to be confused with that other show about giant transforming robots) who are also police officers. Brave police officers. Also, The Power of Love! It starts off with a young boy, Yuuta Tomonaga, stumbling across (or "falling in on", to be more accurate) a giant, half-constructed robot hidden in the basement of (what seems to be) an abandoned warehouse. As a normal boy of his age, Yuuta is thrilled. Yuuta spends the next several months visiting the robot, eventually named "Deckerd", all the while unknowingly granting him a soul and sentience just by being his friend. Through a series of very interesting events at the start of the series, events that include no less than Deckerd losing his memories of those months spent with Yuuta, gaining them back again in time to punch through an armored truck to rescue his friend when Yuuta gets himself into trouble, and Yuuta being inducted into the police force despite his age (all occuring in the very first episode, no less), the series shows its Aesop. And also something about how the bonds and partnerships formed between people (particularly humans/robots) are strong and unbreakable and just plain awesome. More robots are added to the cast, and through Character Development and harrowing ordeals a close knit police unit is formed. Brave Police J-Decker follows their adventures as they work to keep Japan (and sometimes the world) safe. All There in the Manual: It exists as an official manga. Apart from data about the main characters, it had story chapters that fleshed out the characters of the Scotland Yard Brave Police who didn't have more than one or two short cameos in the show. The manga also revealed that Kagero was alive, addressed in its own story. Unfortunately the manga is quite rare and wasn't sold outside of Japan. All Just a Dream: Episode 40. Twice! Animal Motifs: For (Super) Build Tiger it's a tiger; one of Shadowmaru's alternative modes is a dog/wolf. Animation Bump: The first episode is one of the best animated episodes in the series. Even so the quality differences are sometimes jarring - often within the same episode. A whole episode can look flat in their backgrounds and with the characters but the mechs' animation rockets up whenever there is a full transformation scene. Attack of the 50-Foot Whatever: Crosses regularly over with Monster of the Week or Giant Mutant Panda From Nowhere. BFG: Gunmax in his Max Cannon mode and Shadowmaru in Brave Cannon mode. Big Brother Instinct: The whole Brave Police team towards Yuuta. Blonde, Brunette, Redhead: The three major adult women — Regina, Seia and Ayako — fit into this. All three are friends of the Brave Police and have a special connection to one of the robots (be it love or friendship). While Ayako is a typical Fiery Redhead, Seia (brunette) operates in a high-ranking, commanding position in the military, and Regina (blonde) is one of the most intelligent characters in the series. Break the Cutie: Yuuta in Episode 25. Breaking the Fourth Wall: Episodes 24 and 33. Call-Back: Due to his sentience, Deckerd is the only one not affected by the Gaizonite's Technopath powers when it appears for the first time. Later, after being upgraded, it brainwashes him. Calling Your Attacks: Uncommon in this show (everyone uses a standardized revolver, maybe a personal weapon or two), and even then it's mostly the combined forms that do it. Character Title: J-Decker stems from the name of the project out of which Deckerd is created, and from the name of Deckerd's battle form when he is combined with his support vehicle J-Roader. Cloning Blues: The theme of episode 36. Interestingly, it never really comes up or bothers anyone that all the other Super-A.I. robots in existence are copies of Deckerd. Cool Bike: Gunbike. Gunmax's vehicle for patrolling, its other main purposes are either to become a jetpack armor that lets him fly or combine with him to build the Gunmax Cannon. He is so good at driving Gunbike, however, that he uses it for attacking even when it's not in a combat form. Combining Mecha: The Build Team combines into Build Tiger, and with Drillboy added in, Super Build Tiger. Deckerd and Duke combined with their respective support vehicle become J-Decker and Duke Fire. All three of the combiners in full form are gigantic. Then there is the Mid-Season Upgrade that is Fire J-Decker. Because Kunio Okawara was the main mecha designer for the show, combined forms tend to have Gundam-like heads right down to the red chin and even resembling Mobile Suit Gundam Wing style gundam heads (though this series came out a year before). Cue the Sun: In different variations. A Day in the Limelight: Almost the whole series due to the large main cast. The episodes are chronical but can stand on their own; there is an overarching plot, but it only gets visible around the second half of the series starts. Notable examples for characters outside the main cast: commissioner Saejima and Regina, as well as Inspector Miura. Gunmax is a male example. A few of the weekly bad guys come right the hell out of nowhere when you consider this is meant to be a cop show. Not to mention the panda. No, it still doesn't make sense in context, and that fact is lampshaded in-show. This episode was noted so much that said mutant panda returned in Brave Saga 2. Emotion Eater: The South-American demon Inti feeds on hidden desires and makes the affected people act out on them. Since such desires are often of violent or dark nature, Inti's magic caused at least one civilisation's demise by its own people destroying their culture. Empathic Environment: It tends to rain whenever Deckerd is really upset, like in episode 13. Evolving Credits: Both the opening and ending sequences are updated to feature each new member of the Brave Police as they're introduced. The unification phrases, and names. Gunmax likes to say short phrases like this as well. Humans Are Flawed: Although that's not a bad thing by itself, as far as the show is concerned. Humongous Mecha: Of the sentient, non-piloted variety. The robots go a bit higher than 5 meters in their normal bodies. They have also toy and even human-sized "spare" bodies, however, to which their minds can be transferred when their original bodies need extensive repairs. However, they belong to the smallest robots in the entire Yuusha series. The Chieftains are bigger by default. Instant A.I. : Just Add Water! : Deckerd started as a robot with an adaptive, complex A.I. that was supposed to understand, interact and work with humans on a basic level. Yuuta treating him as a person fed his A.I. so much information to work with, it evolved over months to the point he gained intelligence, became an individual and could feel. But he could neither recognize or understand these feelings, before a final push coming from Yuuta "wakened" his self-awareness. Just a Machine: The members of the Brave Police are repeatedly discriminated against because they are "only machines". This happens often both by criminals and allies alike. Even among those people who acknowledge they are sentient, there are voices denying them the same worth as humans or the freedom to choose things on their own, like Vice-Commissioner Azuma did in an episode once. You can imagine that the guys were not happy with this. This never stops them from doing their job to protect humans, however. Shadowmaru explains to Yuuta in the same episode that although they are sentient and can feel, their purpose is to protect humans even at the costs of their own lives. Neuva Fahrzeug killed Victim O'Rand, put a copy of his brain into a Super-A.I chip, then put the chip into an android disguised as human. He made Victim forget he had shot him and programmed him to do after his bidding unwittingly. Combined with Trauma-Induced Amnesia for Deckerd in episode 28. No wonder after the physical and emotional trauma he suffered: Being beaten near death by the two first Chieftains, then Gaizonite merged him in his injured condition with J-Decker into Satan J-Decker, then forced him into wrecking havoc and attacking his friends. Once Gaizonite fled and released his control on Deckerd, he reverted back to his injured state. Million-to-One Chance: Due to Deckerd's combination data having been corrupted from the nature of his Super A.I., it was revealed that if J-Decker and Duke Fire did the Fusion Dance to form Fire J-Decker, there was a high probability that one of them would completely lose his memory, with only a 0.002% chance of them both coming through it with their memories intact. Naturally, when they were forced to go through with it, they both had their memories intact. Mind-Control Eyes: Mechs controlled by Gaizonite get their optics turned red (although it isn't technically mind control initially, as in its first appearance it can only control electric systems and by extension basic A.I.s). Saejima's three robot butlers, King Kaiser, God Bomber, and Ultra Diver, are named after robots from Brave Exkaiser and The Brave Express Might Gaine. While brainstorming names for J-Decker's Mid-Season Upgrade, Saejima briefly considers calling it "Great J-Decker" before dismissing the name as being too common - a nod to the fact that the previous four entries in the Brave Series had all had upgrades for the main robot called "Great (Name)". New Meat: Anyone introduced after the original Build Team, but especially Drill Boy. And Duke, him being the intended replacement for Deckerd. Our Fairies Are Different: Drillboy befriends Fay, a biomechanical being created by a mad scientist, shown by the number "1" on her collar bone. Actual fairies — of the "invisible nature spirit" kind — later adopt her. Her most distinctive and different feature from them is her fish-like tail. Police are Useless: The Brave Police exist because the Metropolitan Police Department got tired of being this trope — and over-corrected for it by a long shot — but the regular, human cops are more than capable of handling 'normal' crimes. The Power of Friendship: It would be easier to list where this doesn't pop up. Gunmax in particular gets hit over the head with this trope constantly. Punny Name: Each of the robots of the main cast has one, intentional. Red Eyes, Take Warning: Many of the malevolent entities (e.g. Inti) or the bad guys' creations have red eyes/optics. Subverted with the Chieftains who act evil, but only because they were programmed to be so and are deep-down actually okay/good, if flawed, persons. Ridiculously Human Robots: Every robot with the Super A.I. derived from Deckerd's mind gains human-like sentience. The designers of the Brave Police didn't intend sentient robots, and didn't even think it was possible they could gain sentience. This makes Deckerd one of the few examples who is this trope by accident regarding the "Ridiculously Human Personality" part of the equation. Justified on two levels. 1) The Project "Brave Police" was supposed to introduce advanced robots working with human police officers and interacting with the normal populace. It makes sense to design them humanoid to enhance general acceptance. 2) Deckerd's original A.I. enabled him to understand human speech, interact on a basic level with people and work in crime investigations. Adding his humanoid body and human face and the interactions with Yuuta, it's clear why his emotions are human or very human-like at the least. Robosexual: Dumpson and McCrane have both been romantically kissed by human women, specifically Ayako and Seia, and return their crushes. One could argue, however, they are attracted by personalities rather than them being machines. There is also the fact that in Ayako's case it's merely in Deckerd's dream in episode 40 and Seia has the excuse of being possessed by an evil spirit that radicalizes desires people would otherwise act on (such as McCrane randomly shooting bikers or Drill Boy playing soccer on the job). Rule of Cool: Lampshaded in one instance. Three of the main robots eventually combine to form a bigger robot called Build Tiger  which, appropriately enough, has a large tiger face on its chest. When asked why, Saejima simply states: "Because it looks cool!" Running Gag: Saejima's imagine spots, combined with his internal Mundane Made Awesome. Or when he dresses in one of his silly costumes, like the pink overall. Secret Government Warehouse: Deckerd was built in one. Yuuta found it by accident when he fell down a hidden vent and landed in the underground laboratory. The warehouse or rather the basement is an important setting in several episodes after the debut. Does Deckerd dream of electric sheep? There's a reporter in the first episode reporting about a crime in Detroit. The reporter's name? Alex Murphy! Episode 2's villain, Noriyasu Kato, is based on Yasunori Kato, the Villain Protagonist of Teito Monogatari. In the same episode, some stolen jets transform into mechas, which can remind some people of Valkyries. Episode 4, we have a toy from Ultraman in the background, and the mecha Black Russian ressembles a robot from Go Nagai works. Episode 6, The robot of the Clowns is a combination of Haro and Gyan. Episode 12, we have a homage to Mothra. Episode 13 has the family name of the three robot theft brothers: Kikaida. Episode 22, a robot wrestling episode with features robots that look like Spider-Man and Wolverine. at and the end of the episode, the main cast of robots are dressed as Gatchaman, the villain of this episode is also a master of disguise, and references Cutey Honey when he reveals his true identity. Episode 33, we have a parody to Honey, I Shrunk the Kids. Episode 34, name of the two girl hackers: Bubblegum Sisters. The looks of the two are also highly inspired by the Lovely Angels. Episode 38, Several Japanese Ghosts! Episode 44 Victim shows the real form. The Hameln Project; the mind-control signal that affects Super-A.I.s is sent out the fortress' figurehead's mouth, evoking the image of a siren. Sliding Scale of Idealism vs. Cynicism: Very much on the idealistic side, although the show never loses focus of the cynical and darker aspects of sentient robots living among and working for humans. See Just a Machine above. Sliding Scale of Silliness vs. Seriousness: The show regularly slides between the two extremes. Silly episodes making fun of themselves (the giant panda comes to mind) alternate with episodes of dramatic and serious content. Spell My Name with an "S": Power Joe is sometimes mistranslated as Power Joh or Powerjoe. Technopath: The Gaizonite in its first appearance can control electric systems, including the A.I.s. of the by that point not-sentient Built Team trio. Its powers don't affect Deckerd because of his Super-A.I. and his sentience. Victim later removes this obstacle when he puts Gaizonite's mind into a Super-A.I. chip and it brainwashes Deckerd. Theme Naming: Episode 4's villain, the assassin Monsieur Monde, names his assassin robots after cocktails. 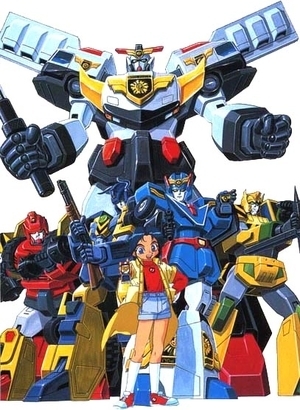 All the main cast's robots have a vehicle form, Shadowmaru even has several. The only exception is Gun Max who needs his own vehicle, Gunbike (a giant motorbike) with which he combines into a cannon that can be equipped by one of the Combining Mecha. This form is appropriately named 'Max Cannon Mode'. Gun Max can also transform Gunbike into a full body armor that lets him fly. True Companions: What the Brave Police end up becoming. If King, Bishop, Pawn and Rook survived after the Hameln Project took control of and forced them to shoot at each other. It feels like Mood Whiplash that this was never addressed — Regina even enjoys a picnic a few episodes later after their apparent demise. She doesn't even say a word about them. The other members of the Scotland Yard BP: Ace, Jack and Ten. If not for the manga we would know nothing about them or their characters. What Measure Is a Non-Human? : One of the show's main themes. You Have Failed Me: The Villain of the Week in episode four, Monsieur Monde, does not tolerate failure.